David Brooks, Desert Rooftops (detail), 2011, mixed media, dimensions variable. There’s a housing crisis in New York City. On a touristy theater district block behind a chain-link fence, an assembly of asphalt-shingled rooftops pokes up from the ground. No windows, doors, or signs of inhabitants are visible at street level, but the distinctive peaks summon up the negative associations of suburban sprawl. At first glance, the odd perspective—confronting roofs head-on instead of from below—is pleasantly disorienting, offering Midtown pedestrians a Jack and the Beanstalk moment. 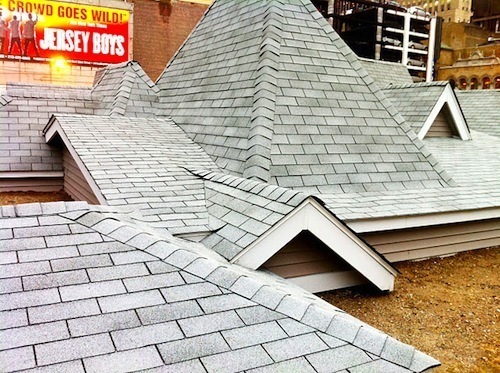 David Brooks’s Desert Rooftops, 2011, is the first installation to grace the Last Lot, an otherwise vacant lot that Art Production Fund will transform with temporary public artworks until its short-term lease ends in August 2012. The startling, incongruous landscape of Brooks’s five-thousand-square-foot sculpture presents a timely political commentary on two crises—the collapse of the US housing bubble and global climate change. Though it is ambiguous whether the symbolic subterranean homes are rising from ground (the burbs are invading!) or being swallowed up (homes are disappearing! ), either way the implication is ominous. The current economic situation makes it impossible not to see Desert Rooftops as a damning portrait of the subprime mortgage scandal and resultant devastating numbers of foreclosures. Brooks is known for his ecological commentary in works such as Preserved Forest, 2010, wherein he “preserved” a sampling of trees indigenous to the Amazon rainforest in concrete and presented the slowly decaying mass in MoMA PS1’s 2010 “Greater New York” show. With Desert Rooftops, Brooks makes his agenda clear by including multiple plaques explaining the concept of desertification: the process by which once fertile land becomes desert as a result of humans overusing the earth’s natural resources. Seen in this light, the undulating rooftops evoke a cautionary postapocalyptic landscape.